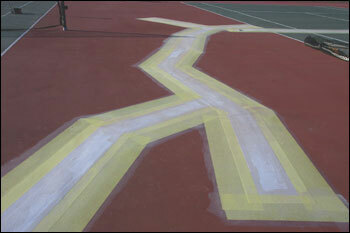 The most common problem with asphalt courts is cracking. Cracking is caused, in part, by asphalt’s natural tendency to shrink as it weathers and ages. In addition, asphalt loses its flexibility and becomes more brittle over time. Since outdoor courts are also exposed to temperature extremes that cause expansion and contraction, cracking is inevitable almost without exception. Quality design and construction may minimize or delay cracking but it cannot completely eliminate it. Once cracks appear, it may be impossible to repair their cause, but it is not impossible to repair the cracks themselves with the ARMOR® Crack Repair System. 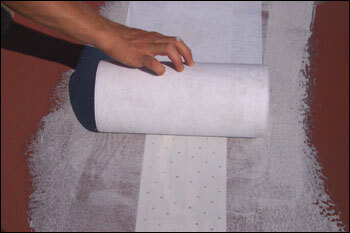 The ARMOR® Crack Repair System utilizes a knitted fabric that will expand as the crack widens. The secret to making this repair work is how it is purposely NOT bonded to the court in the vicinity of the crack, thereby allowing more of the fabric to absorb any movement or growth of the crack without the fabric tearing or delaminating from the surface. Thus, the reason why the ARMOR® Crack Repair System works so well is that it effectively spreads the stress of the crack over a wide area of expandable fabric-other brand name repair “systems” do not do this. 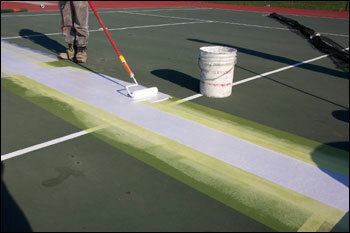 Although your court is technically still cracked, the filled cracks are hidden beneath our repair and then covered over completely with color-coating materials. Although it will not prevent cracks from developing elsewhere on the court, or prevent cracks from growing in length out beyond the repair, the ARMOR® Crack Repair System successfully keeps repaired structural cracks from reappearing on the surface. 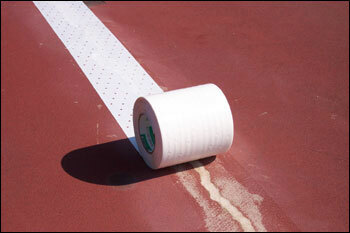 There are some limitations and not all cracks are repairable with our product, so talk to your contractor about your specific court. 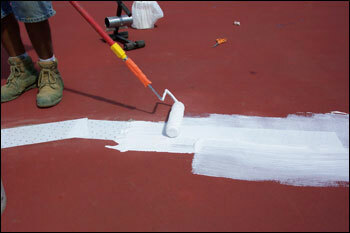 Although your tennis court is technically still cracked, the filled cracks are hidden beneath our repair and then covered over completely with color-coating materials. Although it will not prevent cracks from developing elsewhere on the court, or prevent cracks from growing in length out beyond the repair, the ARMOR® Crack Repair System successfully keeps repaired structural cracks from reappearing on the surface. 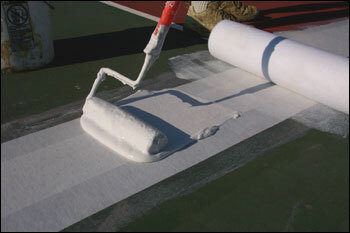 Inherent characteristics of Armor Repairs: On-going asphalt movement under the Armor repairs may cause: “Puckering ” of the fabric layers over the crack, crazing of acrylic coatings over the crack, and dead spots over the crack where ball bounce and ball bounce sound will vary from surrounding court area. These are not covered under the warranty.